Be the first to share your favorite memory, photo or story of Dana. This memorial page is dedicated for family, friends and future generations to celebrate the life of their loved one. 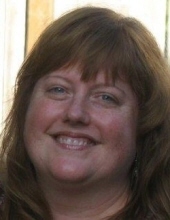 Dana Lynn VanStaalduine of Bremerton, WA passed away on May 5, 2018 at Legacy Emmanuel Medical Center in Portland, OR. She was born in Spokane, WA on August 30, 1964, and adopted by Gene and Doris (Snowden) VanStaalduine. Dana spent her childhood in Mount Vernon, WA before moving to Bremerton and graduating from Olympic High School in 1982. After graduation, Dana served 5 years in the U.S. Marines as a cryptologist specializing in decoding Russian communications. She earned her Bachelor of Science in Nursing from Pensacola Junior College in Florida. Dana spent 10 years in and out of Virginia while working as a traveling nurse. In 2006 she found a home in the PACU Unit at Harrison Hospital in Bremerton and put her traveling days behind her. Dana first met Jean Braun in 1983 and they became friends over long meals, good conversation, and a shared outlook on life. Dana is survived by her loving husband Jean. Dana loved life, and never met a stranger. She was always eager to help and had a no-nonsense approach to life. She was a bright light to those around her. She had boundless energy and a zest for life that was contagious, along with her smile and laugh. She had a benevolent heart, loved unconditionally, and cared deeply for others. Not only was she a caretaker, but a friend, mentor, sister, daughter, and the love of Jean’s life. She was a free spirit that lived life to the fullest and emanated a strength that inspired others. She will not be forgotten as she made a lasting impression on everyone that had the privilege and pleasure of knowing her. She had an eclectic taste and a few of her many interests included her love of her dog Winston, nature, traveling, and camping. To send flowers or a remembrance gift to the family of Dana Lynn VanStaalduine, please visit our Tribute Store. "Email Address" would like to share the life celebration of Dana Lynn VanStaalduine. Click on the "link" to go to share a favorite memory or leave a condolence message for the family.